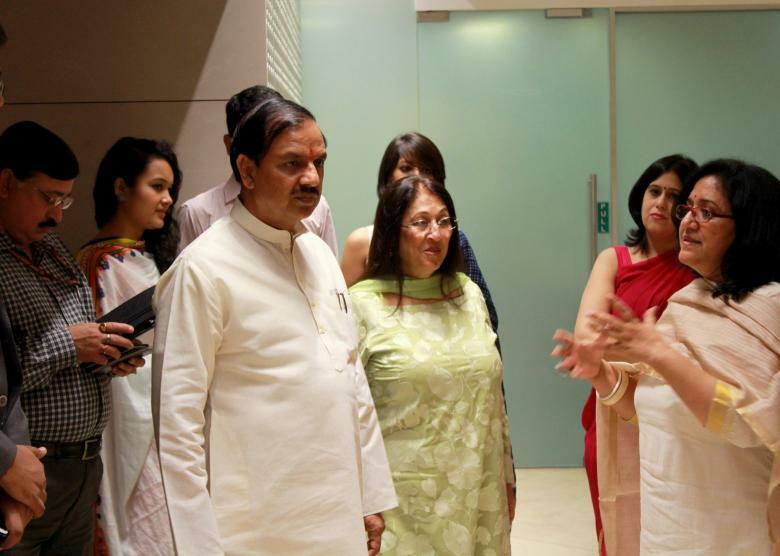 Hon’ble Minister of State (Independent Charge) of Culture &Tourism & Minister of State of Civil Aviation, Dr. Mahesh Sharma had visited the Kiran Nadar Museum of Art on 2nd September 2015. Dr Sharma with Mrs. Kiran Nadar was given an overview of the current exhibition Constructs|Constructions, featuring 30 artists curated by Mrs. Roobina Karode. KNMA Director, Mrs. Roobina Karode giving a walk through to Hon’ble Minister Dr. Mahesh Sharma. Dr. Mahesh Sharma viewing the exhibition.